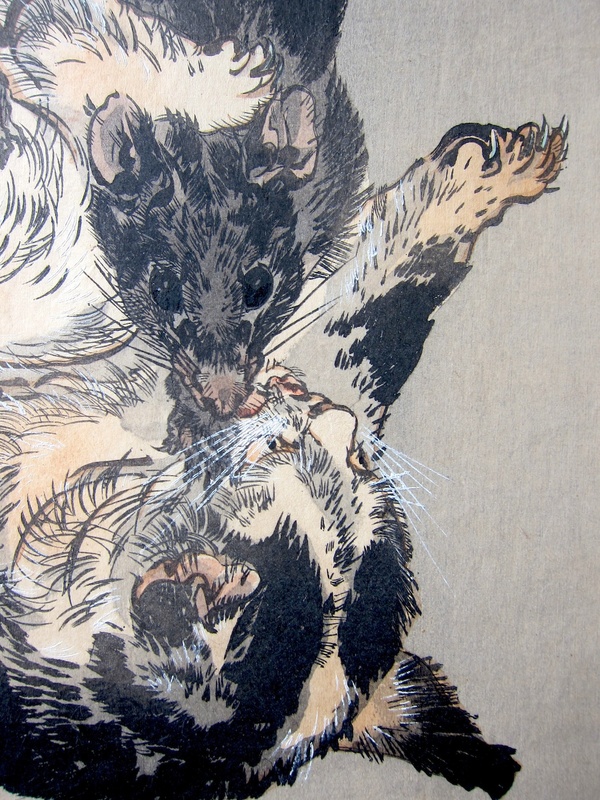 Ogata Gekko (1859 - 1920) The Rat of Kuroishi from Gekko’s Miscellaneous Drawings, 1890’s. Oban. With the artist Ogata Gekko, we see (especially in this series) an almost complete migration away from not only the traditional forms, styles and methods of representation of ukiyo-e towards western (modern) style representation. By the end of the nineteenth century, Japan’s cultural isolation had well and truly come to an end and in the 1890’s artists produced these very exciting crossover works, where there is a creative tension - a push and pull - between the traditional and the western influence. 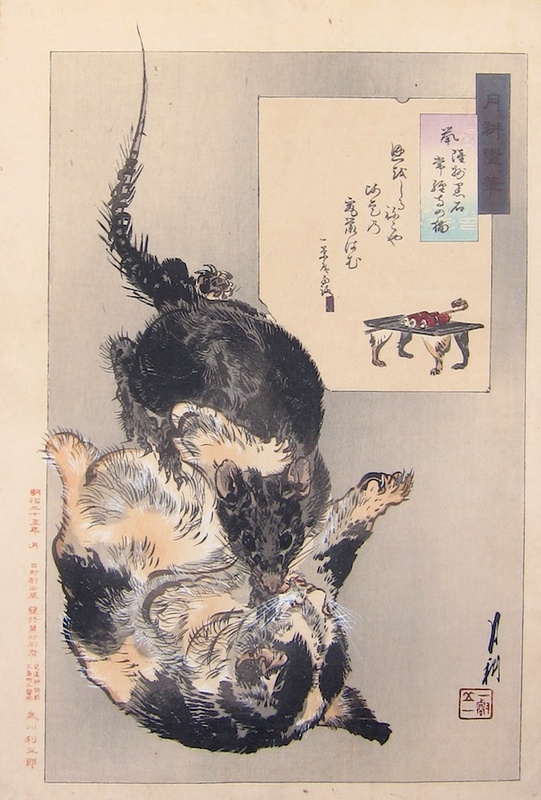 This exceptional print is a masterpiece of sophisticated woodblock printing - note the applied white pigment for the whiskers of the cat, and a beautiful study of the characteristics of fighting animals. Frustratingly, we cannot identify the fable of the rat of Kuroishi nor the significance of the curious cat’s feet table in the cartouche. Nevertheless, the print is very lovely and very expertly realised; this is one of the finest from Gekko’s series, Gekko’s Miscellaneous Drawings, and probably his best and most original series of work. Full size with full margins, excellent condition throughout, very fine impression and colour, embossing to the cartouche.